Once it looked like the future – but now? 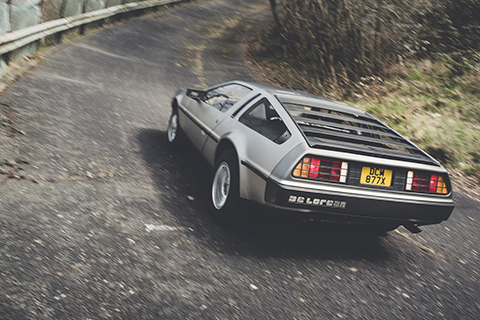 John Simister tests the infamous DeLorean DMC-12 at the factory test track. Words: John Simister. Photography: Amy Shore. Can’t believe how quickly time passes? Let plant growth help you. 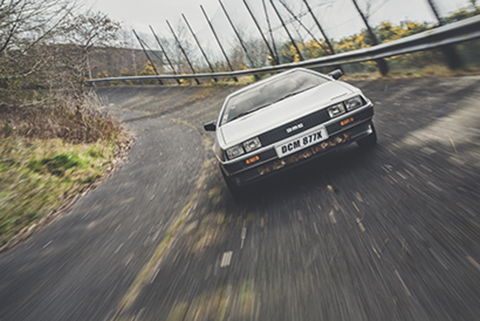 In 1980, a brand new track was ready for the testing of the DeLorean Motor Company’s DMC-12 models as they came off the line at the equally new factory in Dunmurry, a little way south-west of Belfast. It was crisp-edged and clinically tidy, its infield newly planted with sparse, slender trees and small shrubs surrounded by lush grass. A fast straight, a banked turn, some esses and a hairpin formed the main track, while the newly built cars also had to endure a broken-slab pavé section, damper-taxing undulations, a corrugation strip and even a watersplash. Now, in 2016, we’re back at Dunmurry to what was the future. The manicuring of the plant life stopped when DeLorean left the building, in 1983. Since then the former open vista has become almost a forest, the derelict track threading through the trees as moss, algae, dead leaves and twigs cover over and burrow into the concrete surface, and trees take over everything else. The chainlink fencing, erected soon after the start of production to fend off stones thrown by naughty boys at the shiny, steely new cars circulating below it, is twisted and torn. From industrial hope to industrial archaeology in a third of a century, during which Northern Ireland itself has become a normal place to live and most people are leaving the past behind. Even the old DeLorean factory buildings are busy, owned by aluminium-casting company Montupet, making thousands of cylinder heads and similar castings. It still has its ‘wheels’ building, where the DMC-12’s turbine-spoked wheels used to be made and Montupet’s wheels still are. Montupet has no need of a test track. Today, though, moving stainless steel glints through the trees. A DeLorean built at the end of 1981 sets the leaves fluttering as it cautiously increases speed, clearing a track through the debris. That production date was a significant point in the DMC-12’s history. All seemed on the surface to be going swimmingly when Employment Secretary James Prior finally met John Zachary DeLorean as this car was being built, the factory the obvious venue for their introduction because the impressive achievement by all concerned could be shown off and enjoyed. A month later, it all started to unravel. That unravelling destroyed the DeLorean dream. From futuristic GT coupé aimed at ‘horny bachelors’ (so said its creator) to symbol of failure and corruption in two years, the DMC-12 had a tumultuous reputational dive which even that film franchise couldn’t fix. Pundits poured scorn on the overweight, underpowered not-quite sports car with the engine in the wrong place and the gullwing doors that, too often, either wouldn’t shut or wouldn’t open again. Even Mike Loasby, the ex-Aston Martin engineer who acted as DeLorean’s engineering liaison man with Lotus, said in later years that it didn’t handle. ‘We were scheming a four- wheel-drive version, then we went into receivership and the car mysteriously went out of sight,’ he recalled in 2000. But step back a minute. 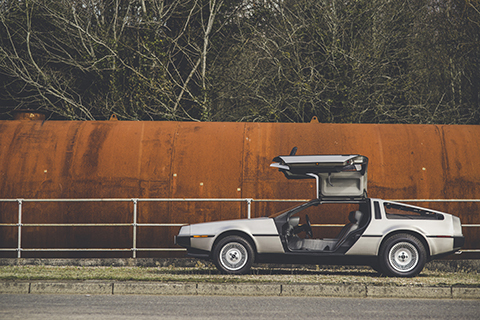 Clear our heads of the baggage, look at this car as though lit by the dawn of a new day, and consider that brand-new DeLoreans are close to production – the remarkable fact that has prompted this whole re-examination, detailed in a following story. And remember that in spirit, if not in exact componentry, there’s some Lotus Esprit in there. This particular DMC-12 belongs to Brian Hamilton, who lives near Dunmurry and has seen the whole story play out. It’s a US-spec car, repatriated via a buyer in Liverpool after its original US owner had it repossessed by his finance company even while DeLorean itself suffered parallel embarrassment. It retains the original, rather high, front ride height and even the catalytic converters, although they don’t do much any more. The speedometer reads to just 85mph, but of course the DMC-12 will go rather faster than that, even if the 2849cc V6 engine, from the Douvrin co-operative venture funded by Peugeot, Renault and Volvo, releases only 130bhp in fully neutered, US-spec Volvo 262C trim. Actually there might be a little more here, given the likely lack of catalytic contents, but it will still be some way short of the 163bhp developed by the few European-spec DeLoreans that escaped. He then points out that his car has the last and simplest of three bonnet designs, the first featuring a glass access flap in front of the driver’s side wiper for quick access to reservoirs, the second adding a pair of strakes. This final version is completely plain. The plainness suits the simplicity of the rest of the Giugiaro-drawn shape. Its proportions are almost those of a front-engined car, but of course the engine hangs out the back like the similar PRV V6 does in the contemporary Alpine A310. Colin Chapman, while talking through Lotus’s ideas for making John Z’s floundering idea into a reality, wanted the DMC-12 to be mid-engined like the Lotus Esprit, but DeLorean insisted on a rear engine to make room for a set of golf clubs behind the seats. That apart, the Lotus re-engineering of the DMC-12 – basing it on a steel backbone chassis instead of a rather floppy composite monococque – created a car very Lotus-like under the skin. The bodyshell was Lotus-like, too, made in upper and lower halves which were injection-moulded in glassfibre. The brushed stainless steel is merely a cladding, contributing to the 180kg weight gain over an Esprit. To see the DeLorean alive, on the test track it first lapped in December 1981, shouts of survival. It has somehow transcended the opprobrium, as have more than 6000 other examples estimated to be alive today out of 8583 built. The design has aged rather better than we might have expected, its Giugiaro-folds not so sharp as to force it into the designer’s origami pigeon-hole, its detailing crisp, clean and confident. The rectangular headlights were US-mandated but suit the face well, the tail-lights are redolent of Rubik’s Cube. The wheels hint at jet engines and the slatted fastback is pure Italian supercar theatre. The doors, of course, are more theatrical yet. Open, they make the DMC-12 look like an insect about to land. Closed, they make you feel as though sealed in a time capsule (oddly enough). During the movement from one state to the other they protrude beyond the DeLorean’s flanks by only 13in, so they’re actually a boon in a tight parking space. I’ve threaded my backside over the sill, followed by my legs, and I’ve pulled the door down and shut with a vault-like kerchunk. To my left is a small ‘tollbooth’ window, electrically activated and the remedy for any impending claustrophobia. Actually it’s surprisingly airy in here, thanks to plenty of glass and a decent view aft through the slats. 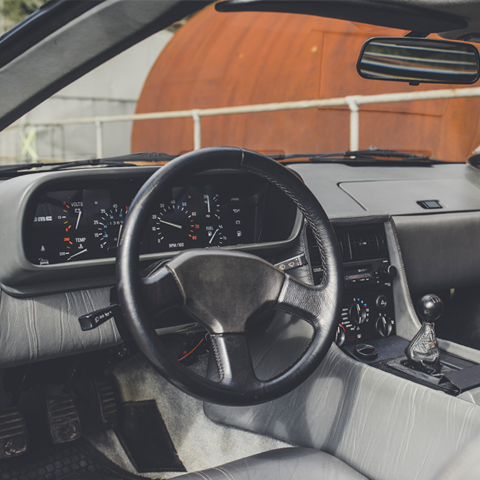 Light grey trim helps the light reading, although the black that is the other common DeLorean cabin colour gives a more sporting and more European ambience. Ahead is a concave instrument rather like an Esprit’s, sitting separately and Lotus-like atop a fallaway dashboard. I feel sunken below a thick, chassis-filled centre tunnel, surrounded by switchgear and materials some way removed from notions of premium-class quality that lashings of leather trim can’t quite counter; yet despite my proximity to the ground I still have a fine view forward over the low bonnet. The engine idles with a deep, quiet burble. First gear, of five, is found in the narrow, springy, long-throw gate; I’m glad this DMC-12 isn’t the sluggish automatic, as many are. I move off to the busy, offbeat burble of this all-aluminium V6 with its 90 o vee-angle and uneven firing intervals, its strong low-end pull and easy manners setting a relaxing tone. This, clearly, is no sports car but it will be a good friend in traffic. Up through the gears, whose wide spacing would reveal the DMC-12 to have long-legged cruising ability were I able to get to such speeds. This is hard on the test track, where even 4000rpm in fourth gear would feel over-ambitious on the banking’s sub-optimal surface. And that’s about as fast as they went there back in 1981, too. Power on this US-spec car seems to fade once past 4500rpm, even if the granular exhaust snarl remains, but I know from experience that a Euro-spec DeLorean has a whole lot more high-revs energy. With a turbocharger or two it could go very nicely indeed, as aftermarket conversions have proved and DeLorean itself was intending to show (see Using the Force, next page). The engine, then, we can excuse. 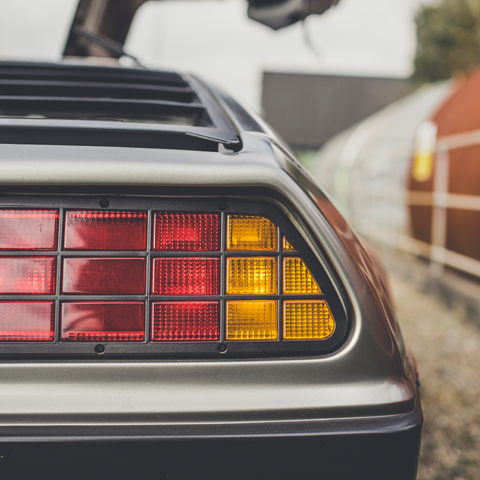 So how, really, does the DeLorean handle? Well, the eager, massless-feeling pointablity of a good Lotus Esprit isn’t to be found here, but neither is the DMC-12 a lugubrious pudding with a sting in the tail. The track’s shifting surfaces will exaggerate any slippage from one end or the other, and any tendency to power-on or lift-off pendulousness will quickly become clear. There is none; all that happens is that a burst of power when turning pushes the nose wide, as it does in other aft-engined sports cars such as that well-known one from Germany. Higher speeds and higher cornering forces could bring about a different outcome, of course, as could a significant power hike, but even that Euro-spec DeLorean I drove a while ago on some properly quick roads felt well tied down. The heavy body helps to offset the effect of the rear-slung engine, causing 62% of the DMC-12’s mass to sit on the rear wheels where you might have expected more. This also explains the heavier-than-expected steering at low speeds, there being no power-assistance. Twin turbos and power-assistance could turn the DeLorean into something rather good, I suspect. As it is, the steering is a little slow, albeit precise and informative; it reminds me of an early Honda NSX’s, actually. Brian Hamilton’s example rides quite well, a few age-related clonks and rattles aside which are on the to-do list; lowering and stiffening the suspension, while sharpening the responses and improving the looks, might spoil the relaxed, carefree cruising vibe that the DeLorean does so well. So here’s the truth. We already knew the DMC-12 is a striking-looking car with a tempestuous story. But it also has the makings of a fine machine, with an ability to match the charisma if just a few tweaks were made. The new ones with their modern engines could see the potential realised at last, provided the engine is the right one. And what would the right one be? I wish it could be Jaguar’s supercharged V6, but something Stateside-sourced is rather more likely. The rusty orange tank that forms one of our photographic backdrops once fed the DeLorean Motor Company’s boilers. Nowadays the Montupet factory uses mains gas instead. Redundant heating pipes pass above us, and nearby is a brick hut that once housed the only unleaded petrol pump in Northern Ireland, for filling the factory’s catalysed progeny. The pump has long gone. Inside the factory buildings, though, you can still see the remains of the rails where the assembly lines ran. Just visible beyond the test track’s forest is Warren House, where the company bigshots and their guests stayed. A private road, long impassable, linked house and track. 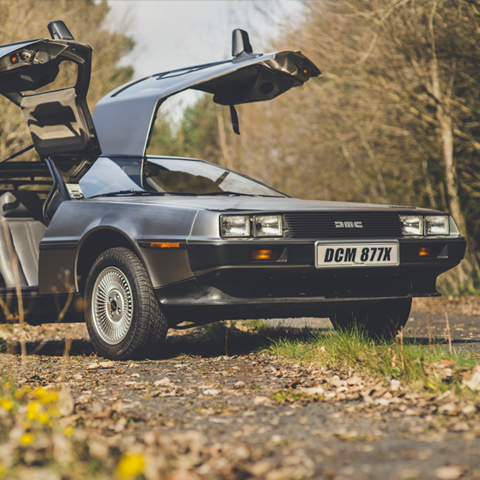 The DeLorean Owners’ Club has an annual pilgrimage to the test track, hiring tractors with undergrowth-clearing gear so they can drive on it again, but the threat of the track’s sale to property developers is ever present. The club would like to buy the track and the house, and restore both to how they were, but that is unlikely to progress beyond a dream. People hereabouts won’t forget the DeLorean and what it meant, though. Our activities have attracted much interest. ‘Nice that it’s come home,’ said one. It is indeed. Thanks to Montupet UK Ltd, Brian Hamilton, Christopher Parnham, the DeLorean Owners’ Club UK, and the DeLorean Owners Association, organiser of Eurofest 2016. A celebration of the DMC-12, Eurofest 2016 takes place in Northern Ireland on 26-29 May. For tickets, visit eurofest.deloreanowners.org.